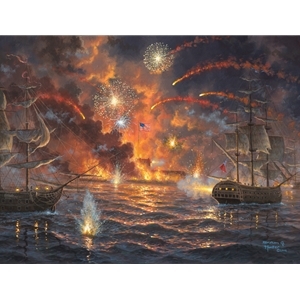 During the war of 1812, Francis Scott Key witnessed the bombardment of Fort McHenry, a US Fort guarding Baltimore. The enemy warships relentlessly pummeled the base with rockets and artillery all through the night. In the morning, the constant fire still could not bring down the flag or discourage the defenders to surrender. Francis was so inspired by the sight that he wrote a poem titled the "Star Spangled Banner." That poem was set to music and became the national anthem of the United States, the Land of Liberty. All of my life, I've known Americans to be at war with terror and at war with each other. We are so tempted to lose our love for this country when we see corruption in politics, such division over what party we vote for, and murder and hate over the tint of each other's skin. We lose sight of the fact that so many have fought, wept, prayed, and died to keep this country free. It troubles me that we dishonor them everyday with our hate. We forget history, and we repeat it. I was inspired to paint this 12x16, and I'm so glad to be able to share it with you. Just as the flag in the center of the painting flies high despite the efforts to bring it down, let us be a beacon of light and hope to each other. May God bless and help us heal America.